Think of each container as a tiny VM. loopback only works inside each individual container. Container to container communication goes through the docker network. Ohhhh that's true! 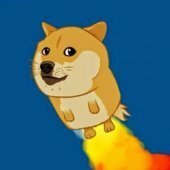 I'm new to Docker and containers. This morning I am getting errors from apps that all indexers failed. Haven't changed anything. Anyone else having same issue? nope all enabled for me check out fine, do you use privoxy to bypass isp blocking by any chance?, if so make sure deluge/sab/rtorrent vpn dockers are operational, if they are down then so will privoxy and thus jackett will fail to connect to anything. Must have been a hiccup or something. Just check again and all but 2 are ok. I think this is the correct place, as I beleive my error is to do with jackett. My setup is BINHEX-DELUGEVPN, BINHEX-SONARR and BINHEX-JACKET. if i go into sonarr and download it manually, it works ok. If i restart jacket, it picks it up and downloads automatically. Today i discovered, that if I just look at the 'view cached releases' within jacket, deluge will download. Having issues with getting this to run behind proxy. As you can see it shows my real IP. The other issue I am having with jackett is none of the indexers are working with sonarr. The same indexers work for radarr. The settings match. I checked categorizes and show them as valid. Any idea? Fixed... Deleted everything jackett related then reinstalled first. Settings somewhere was messed up. Am i the only one having big memory leak issues since the last update of jackett container? Nope im getting this as well it looks due to mono and possibly interaction with jackett not much I can do about it but feel free to raise it as an issue on the jackett github repo or add comments to the existing issue. hi guys, i have a problem im not figuring out. I have jacket installed and use it with medusa. i just noticed that i have not gotten all of the eps for one series. And i then checked in jacket to see if the series eps would be available if i did a manual search in jackett.. and behold they where. But medusa still get no eps found. And i have the search settings correct setup in medusa. All series have the same settings SD, 720, 1080 etc. Any pointers? i was thinking there was a cache issue but as all eps are available inside jacket that should not be the case. Did you set up categories? Can you search in Medusa? Search for epposides that are wanted but not yet downloaded? Hi, I'm confused as to where the data folder should be mapped to? this container does not require /data, keep in mind jackett does NOT download anything, its simply a way to allow any application (example sonarr, radarr, cp) that supports a newznab/torznab formatted api to download the torrent or grab the magnet link from multiple index sites, your usenet/torrent client is the application that actually does the downloading. I'm having trouble connecting to Jackett from Radarr/Sonarr when using delguevpn privoxy. I have Jackett and Radarr proxy settings set-up as below. Radarr is able to connect fine to deluge, and Jackett is able to connect fine to the indexers. However, Radarr is unable to connect to Jackett. When I turn off the proxy settings of Radarr, I am able to connect. Any ideas? I'm new to this so let me know if I'm missing something obvious. I have even added a username and password to my delugevpn and I still can't get it to connect. On the LSIO docker I did this way, @binhex might be able to comment whether something similar can be done or added to this container. 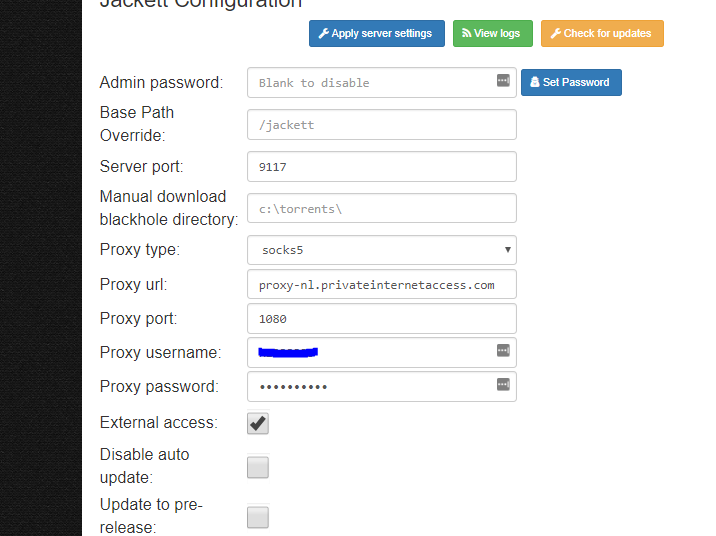 interesting!, so i can confirm the built in proxy configuration for jackett (as in through the web ui) works for me when pointing at privoxy, HOWEVER i have never attempted having an indexer (such as radarr) targeting privoxy AND also having jackett pointing at privoxy so that may well be problematic. it would be interesting to see if pointing the container at privoxy (as per your suggestion @tjb_altf4 ) does indeed fix this scenario, although i wouldn't be overly keen including this in the template, as its more of a generic 'fix' that could be applied to any/all images, but i def would include it in the faq if found to work. How do you test the Proxy within Jackett? I tried that command you you can run against a docker to show the IP it is using. I cant remember where I found it now. How do you test the Proxy within Jackett? simple, you shutdown the container running privoxy, then go to jackett web ui, click on the "test all" button, if any pass then jackett does not honour the proxy being set, if they all fail then all is good :-). Is web address right? I do not have jackett in my url. Didnt realize it, but clicking the WebUI button was putting that in the url. Removed and now it works.